As I'm sure I've mentioned before, I love summer. Or maybe I've just complained repeatedly that I hate winter; I forget. Anyway, the long hours of daylight? The heat? The fresh fruit in season? Bring them on! Even the humidity doesn't bother me all that much. (I'd be willing to skip the mosquitoes and the violent thunderstorms/hailstorms/potential tornadoes though.) Of course, the best thing about being a plant lover in the summer is all the growing that is going on. Sansevieria hallii. The new leaf is second from the right. I also redid the top dressing for a neater look. Another view, showing how nice and thick the leaf is. It is the shortest leaf now, but I expect it to continue to grow taller. 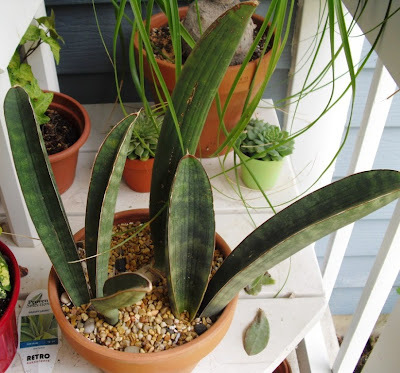 As for my Ledebouria socialis, which I posted about on July 8, I decided to get a nice big bowl to plant it in. 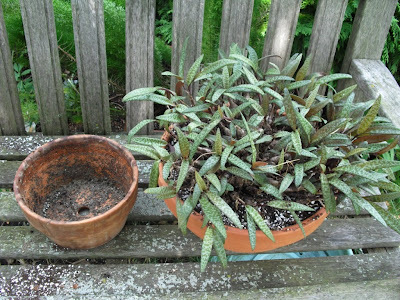 Ledebouria socialis in its new pot, with the old pot for comparison. I didn't have to break it, after all. Finally, I did get back to the Chicago Botanic Gardens after all, just yesterday. And the flowers on the bottom part of the giant Agave stalk were open. Closer: The flowers at the bottom of the stalk have opened; the buds at the top are still closed, and the ones in the middle are in intermediate stages. 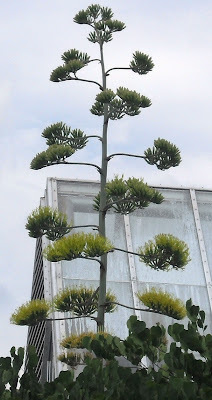 Previous posts about this plant can be found by clicking the "Agave" label below. 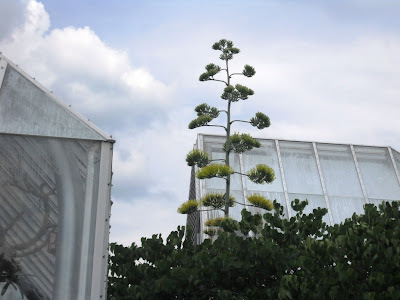 As the summer progresses, I'm sure I'll have even bigger things to blog about. As it is, I have had to move at least 20 succulents to larger pots, and I'm sure there is more of that in my near future. The severe weather is the only part of the summer I like. And we never get enough of that. Well, I guess the fresh fruit is nice too. Still, outside, I'm really only happy from October to April (but excluding January, 'cause even I have my limits). What a great update. That new leaf looks very healthy and thick and I bet it becomes the tallest yet. 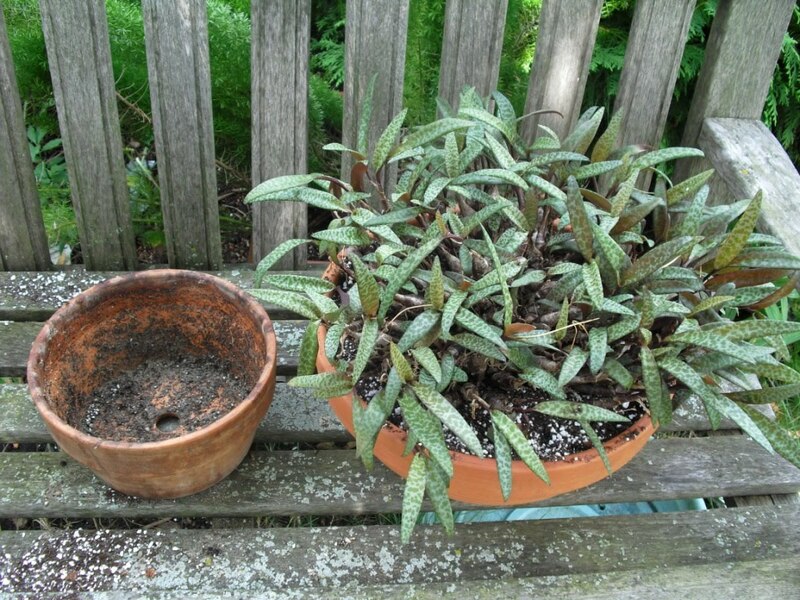 Your new potted plant looks awesome and I bet it is much happier. I am glad you didn't have to break the pot because they are expensive aren't they? 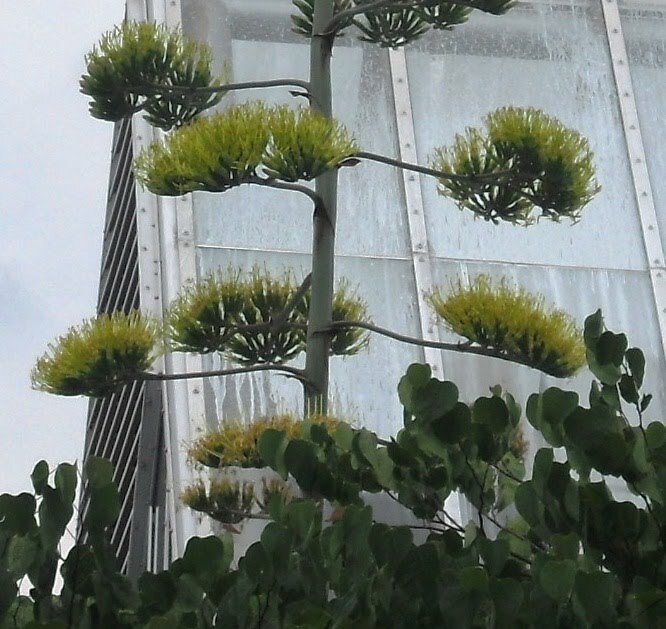 And that Agave is breathtaking! Wow your pics are great. Oh my goodness I love it so much!